Heart of the European Union and home to core European institutions, Luxembourg is well-known for its successful steel and banking industry. Enclosed between Belgium, Germany and France, the country with its 600000 people is also home to about 170 different nationalities, making it one of the most multilingual and multicultural places in Europe. Luxembourg, the only remaining Grand Duchy in the world, looks back to a rich history and culture, with its more than 50 castles, its famous old town fortifications, its museums, theatres and music venues, and not least, its restaurants. 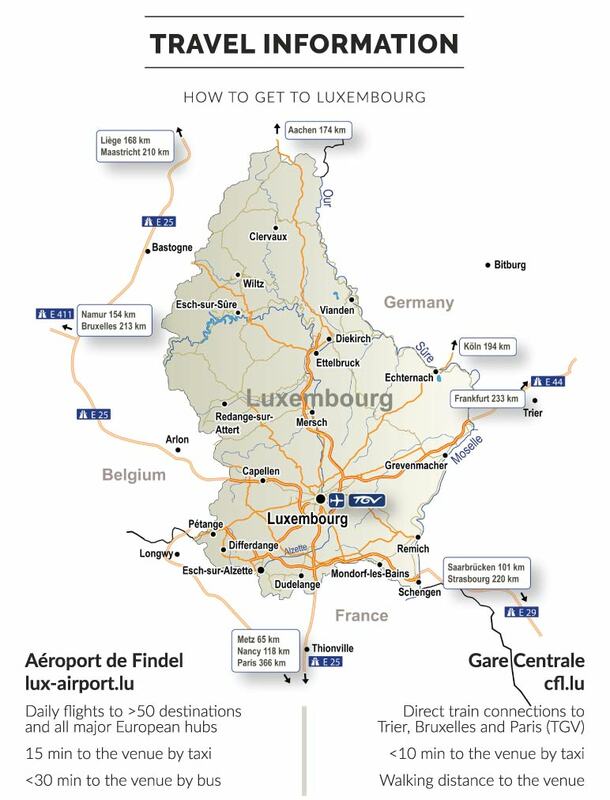 Luxembourg City, home to 100000 inhabitants, benefits from a reasonable size, perfect to be explored by foot or bike. With the recently founded University, and long established public research institutes, the country is emerging as hub for scientific development and higher education. Strong international collaborations and good funding opportunities are boosting innovation in fields as diverse as material science, biomedicine and communication technology, in addition to classical academic disciplines. Join us for the NEUBIAS conference in Luxembourg and explore the many attractions we have to offer! The 3rd NEUBIAS conference will be hosted at two landmark sites of Luxembourg. Training Schools and the Taggathon (2-5 February 2019) take place on the university's new Belval Campus in Esch-sur-Alzette. 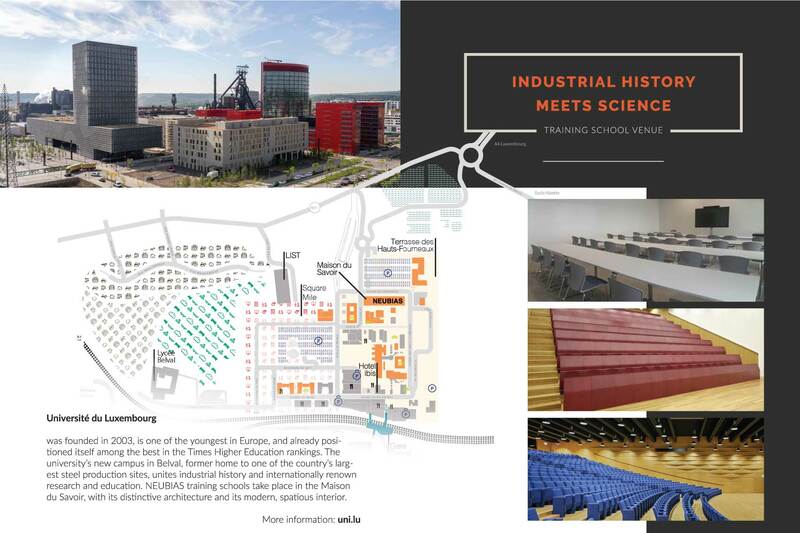 Located on the former grounds of one of the country's largest steel plants, the site combines industrial history and science, with direct connections to downtown Luxembourg and easy accessibility by car, train or flight. 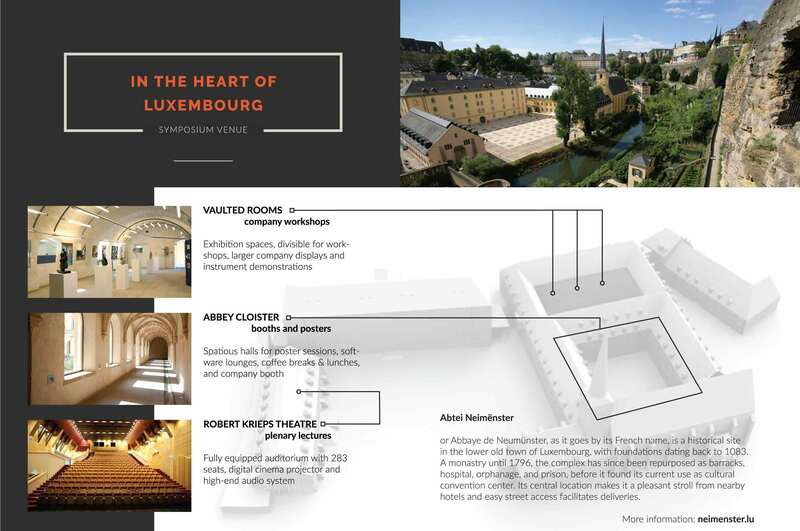 The Symposium (6-8 February 2019) takes place at the historical Abbaye de Neumünster, in the Old Town of Luxembourg. It is conveniently located within walking distance of several hotels, a modern and comfortable youth hostel, and many of the city's attractions. A number of hotel rooms have been pre-booked for the NEUBIAS Training Schools, Taggathon and Symposium. When making your reservation, please be sure to specify your participation in the NEUBIAS conference to benefit from the negotiated room rate. Our conference office will gladly assist you with your booking, thus do not hesitate to contact us beforehand. Negotiated rates are guaranteed until a limit date, after which unbooked rooms will be freed. Hover on the room rates to see limit dates, where applicable. To the room rates, a city tax of 2 EUR is typically added per night (subject to change). Youth hostels in Luxembourg are modern and comfortable, and are a good alternative for budget accommodation. Rooms can be booked for single occupancy and with private bathroom. The hostel in Luxembourg City is a short walk away from the symposium venue, while the one in Esch-sur-Alzette is perfectly located to attend the training schools. A bus transfer service will be organised from the training school location to Luxembourg City hotels on Tuesday, February 5th, for trainees who wish to move to an accommodation closer to the symposium location. The event is organised and hosted by Dr. Andreas Girod (andreas.girod), Life Science Research Unit (LSRU), and Dr. Aymeric Fouquier d'Hérouël (aymeric.dherouel), Luxembourg Centre for Systems Biomedicine (LCSB), at the University of Luxembourg. The conference office is held by Ms. Simone Rosinus (simone.rosinus). The local organisation team can be reached at any time per email to neubias@uni.lu or their respective username (all @uni.lu).